Can you make a key when I have lost mine? Our expert locksmiths are able to “impression” a key from a lock in most instances on older makes and models of vehicles. Sometimes it’s easier to just replace the cylinder in a house lock. New vehicles with “transponder” keys are more difficult. A transponder is a computer chip embedded in the key itself and requires another computer to match it to your car’s brain. 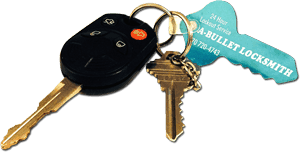 The replacement keys are pretty expensive and usually your car’s manufacturer can supply you with a replacement key much cheaper than we can. At other times, all we need is a code from your manufacturer that we can use to program or cut your new key. Please call us to discuss your particular key.